If odd noises are coming from under the hood, strange smells are coming from the exhaust, or your check engine light is on, a trip to a car mechanic for a car repair is in order. 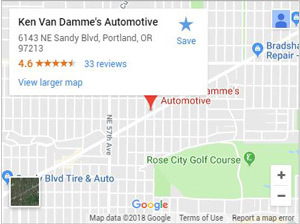 Ken Van Damme’s Automotive has spent the last 20 years serving Portland and providing outstanding service, cementing our reputation on built on honesty and excellence. Our mechanics will be happy to answer any questions you have about your car. Whether you need a tune-up, transmission services, or engine repair, our mechanics carry out repairs in every area to your satisfaction. Do I need to repair my muffler? There are a few tell-tale signs that your muffler needs to be fixed. Listen for unusual sounds, like rumbling, clattering coming from the tail pipe. and the catalytic converter, oxygen sensors. How do I know if my alternator needs repair? When you see warning lights apear in your dash area that say BATT, GEN, or ALT, usually this indicates a problem with your alternator. When the engine makes a rumbling noise, accompanied with a difficulty in starting your car, then it may have to do with the alternator. Other times, lights flickering could mean overcharged alternator. Drivers often shudder at the sight of a check engine light. However, a check engine light doesn’t always point to a catastrophic fix to your engine. Sometimes, a check engine light can be due to a faulty sensor. Whatever the case may be, our mechanics go over the diagnostics before coming up with an estimate of for any repairs to your engine. Do you repair foreign autos too? We repair Japanese makes like Lexus, Toyota, and Honda. For German vehicles, we service Volkswagen, Audi, BMW, Mercedes, and Porsche. And Swedish cars, like Saab and Volvo, are in our wheelhouse as well. You can trust our technicians to understand foreign manufacturer recommendations. We’ll assist you with staying up to date about your vehicle’s parts and periodic services. What does tire rotation services include? Our tire rotation services involve a number of checks, diagnostics, along with rotation service. We check your tread for wear and tear to ensure that your tires have maximum life and functionality. And we go the extra mile by checking your spare’s tread as well. We also run a pressure check to ensure your tires are getting optimal inflation when traveling along the road. Having evenly pressurized tires ensures efficient gas mileage and even tread. Tire rotation involves changing out old tires and replacing them with new tires for the best performance and traction. At times, that may mean changing the right for the left, and vice versa. Other times also changing out the back for the front is necessary. When do I need a transmission fulsh? Usually, your owner’s manual will tell you how long your transmission fluid will last. However, if you have over 100,000 miles on your vehicle, a transmission flush might be in order. Some of the most common, tell-tale signs of transmission fluid issues would be a “thunk” sound when you accelerate accompanied with sluggish accelaration, as well as grinding noises. Also, if your transmission fluid appears brown or black, you may need to flush your transmission and change the fluid for better performance and efficiency. You can always tell a radiator fluid leak by the color of the fluid as it pools underneath your parked car. If the liquid is a greenish color seeping from the front of your car, then you will need to take your car in for radiator repair. Other issues with your radiator arise while you turn the ignition and the heat gauge rises. If the temperature gauge goes into the red while your vehicle is in motion, you may need to take it in for radiator repair right away. When it comes to new vehicles, usually a dash light will let you know about overheating. Of course, overheating is a serious problem and a sign of engine distress that should not be ignored. After pulling to the side of the road to let your engine cool for fifteen minutes, take your vehicle to our shop for immediate repairs. You do not want to drive on a damaged radiator, or else you will see bigger problems with your car down the road. How do I know if my car needs wheel alignment? This is easy to catch and easy to fix: You notice your car gravitates to one side, and you have to have your steering wheel slightly turned to maintain a straight path. When you experience misalignment, you need to take your vehicle into the shop before the alignment gets worse. Misalignment is often caused by uneven road, especially if you drive a 4-wheel drive off road. About once a year, any passenger vehicle should have corrective alignment. If you hit a bump hard your should have the alignment checked out soon after. How do I know when to repair my tires? Sometimes all it takes to repair a tire is a simple patch. If you have a tire with a nail or other sharp object stuck into the tread, our tire technicians have the knowledge and know-how to either repair or replace your tires. If a simple patch is all you need, we’ll fix your tire at a low cost and send you on your way. If new tires are what you need, then our tire store offers a vast selection of in-house stock for all variations of driving. Our tire experts know the right tread for your driving habits and hobbies. 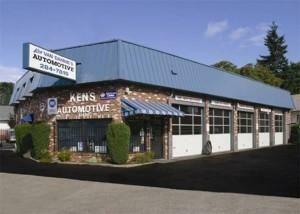 Since 1968, we’ve built lasting customer relationships with the best auto maintenance in Portland. Our reputation rests on our accurate diagnostics, honest estimates, and reliable repairs. Our expertise in mechanics and tires stands on a reputation of excellent customer service and quality control. Come to our Portland shop, and we’ll happily answer any pressing questions you have about your vehicle. We pride ourselves in taking the time to explain our inspection and honest estimates with you. With no hidden fees or erroneous recommendations, we rely on your approval before commencing on your car. © 2019 Ken Van Damme's Automotive. All Rights Reserved.